The subterranean termite is the most common and destructive type of termite in Arizona, and the one you’re most likely to see trying to eat your home. 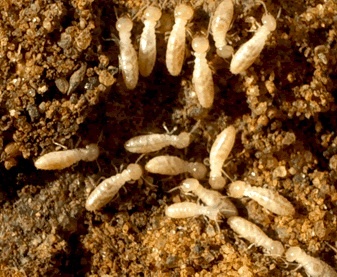 Subterranean termites live in the soil under and around your home. There are several ways to protect your home from these pests. At A-Agents, we use what we consider the most effective method of termite control, the invisible perimeter barrier. Perimeter barriers are the most effective preventative and corrective way to treat for subterranean termites. These treatments are created by applying termiticide around the foundation of a home. With this treatment, the chemical barrier applied to the foundation can’t be detected by termites. As they pass through the barrier, the termites become ‘infected’ with the termiticide. When they return to the colony to communicate and share their food, they pass that infection along to all the other termites they come into contact with. Then those secondary termites spread the ‘infection,’ and it keeps spreading throughout the entire colony as every ‘infected’ termite is now a carrier. 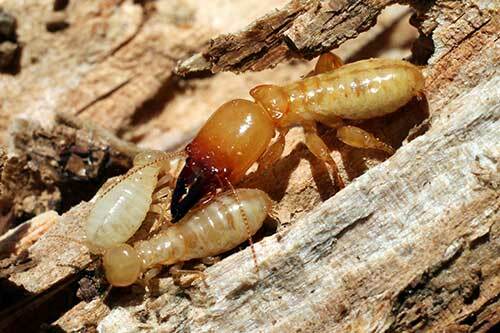 This, in our opinion, is the most effective type of treatment for subterranean termites. Our technician digs a shallow trench along the foundation of the home, at a depth and width specified by the termiticide’s label. Using a calibrated and pressurized rodding and injection tool, the correct amount of “non-repellant” termiticide sprayed into the trench as per the chemical’s label instructions. After the application, the trench is back-filled, and any landscaping that was disturbed during the trenching is replaced. If there are attached patio slabs, entryways, or garage slabs showing signs of termite activity, we use a specialized concrete hammer drill to make small, nickel-sized holes spaced evenly based on a specific termiticides application requirements. Our technician will then use the same pressurized injection rod to inject the required amount of termiticide underneath the concrete slab. Upon completion of the sub-slab injection, or technician seals up all the drill holes with concrete patch, and cleans up any additional dust and debris caused by the hammer-drilling. We ask that prior to our arrival, any furniture, storage material, or debris are moved at least eight inches away from the exterior footprint of your home. We also advise customers to make sure our technician will have enough room to walk around the interior perimeter of the garage to ensure a thorough and complete treatment. Our Arizona state-certified technician will arrive on time on the scheduled day of treatment with his copy of the treatment proposal our termite inspector provided you. The technician will introduce themselves to you upon their arrival and answer any additional questions you may have before they begin the treatment. At A-Agents, we make sure all termite treatments are in accordance with the Arizona Department of Agriculture (our governing body), the manufacturer’s label requirements, and our own dedication to provide a job well-done. When your the termite treatment is complete, if subterranean termites re-occur anywhere in or on the home during the term of your service package, we will return immediately to retreat any problems that may have returned – at no charge.